A template is simply a design area in BarTender where you design the items you want to print. Each template can have any number of barcodes, pictures, or text objects to give you a true WYSIWYG experience with BarTender. This video will show you the basics of working with templates in BarTender. By default, each new document contains one template. However, you have the option to create multiple templates in a single BarTender document. This gives you the ability to create, for example, separate front and back designs for your document, or a leading document to be printed at the start of each print job. Select the icon on the main toolbar to open the Page Setup dialog. Alternatively, from the BarTender File menu , select Page Setup, or double-click on any blank area of the template. Click the New Templates icon to create a new template, or right-click an Item Template folder and select New Template from the context menu. You can drag templates to any Item Template folder. Placing a template in an Item Template folder determines when the template will print. Start of Job Template(s): Prints the template once, at the beginning of the print job. Start of Group Template(s): Prints the template each time the specified data source changes (as specified in the Group Field control). For templates in this folder, copy count and serialization count are ignored. Primary Template(s): Templates that you place in this folder may print once or multiple times, based on the copies and/or serialization settings. End of Group Template(s): Prints the template each time the specified data source changes (as specified in the Group Field control). For templates in this folder, copy count and serialization count are ignored. End of Job Template(s): Prints the template once, at the end of the print job. 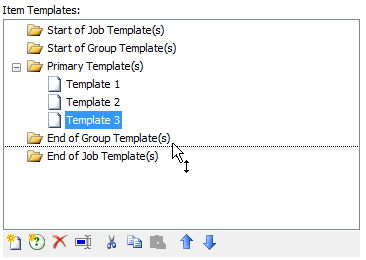 Note: Group templates are only available in Automation Edition and above. Template Selectors are used to conditionally print a specific template when multiple templates are in use. When using template selectors, you will need to create one template selector for each conditional statement; subsequently, you will add new templates to be included inside of the template selector. When you execute a print job, exactly one of the templates in the template selector will print based on the specified data. Select the icon on BarTender's main toolbar to open the Page Setup dialog. Alternatively, from the BarTender File menu, select Page Setup, or double-click on any blank area of the template. Select the Item Template folder where you wish to insert the new template selector. 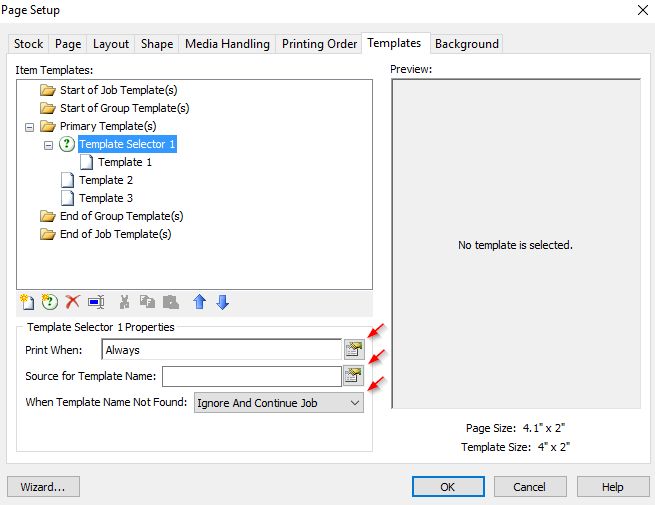 For special templates that print only at the beginning or end of a print job, select Start of Job Template(s) or End of Job Template(s). All other template selectors should be added to the Primary Template(s) folder. Click the icon on the template toolbar. Alternatively, select New Template Selector from the folder's context menu. A Template Selector pane appears below the Item Templates pane. In the Template Selector Properties section, specify the database field or data source value containing the name of the template to print in the Source for Template Name field. 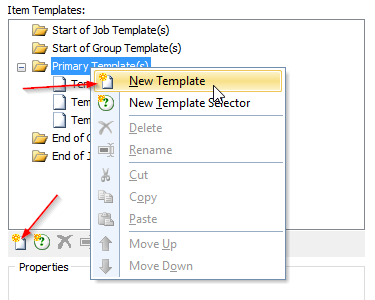 Add templates to the newly created template selector by dragging an existing template into it or creating a new one. Click OK to close the Page Setup dialog. Note: Any template that will be selected by the template selector has to be placed under the Template Selector folder. Below you can see Template 1 is under Template Selector 1. 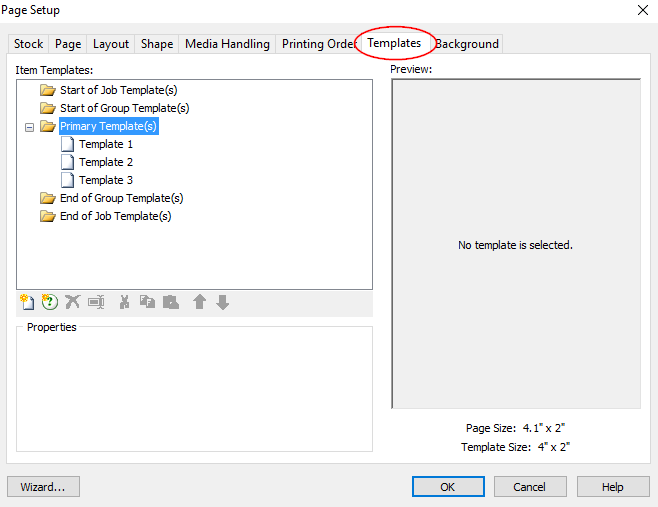 Once you have created the template selector and placed a template below it, you can set the Print When, Source for Template Name, and When Template Name Not Found settings. For more information, refer to the Using Template Selectors topic in the BarTender help system.